This field will auto-populate if you are logged in. If no information appears below about the number of people you wish to register, please email office@psjc.org and membership@psjc.org. 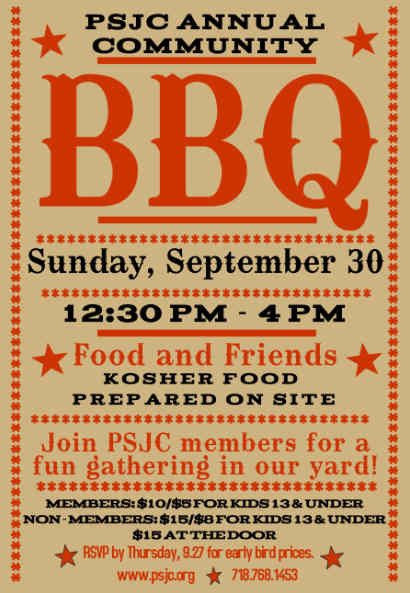 012345678910 # PSJC members age 14 and older + - $10/person until midnight on 9.27 ($15 after). 012345678910 # PSJC members - children 4-13 years old - $5/child until midnight on 9.27 ($8 after). 012345678910 OR....# PSJC Family of 4 or more (2 adults & 2 or more children ages 4-13) - $30 cap until midnight on 9.27 ($40 after). Please indicate how many people (PSJC Members) are in your party. Please indicate how many (Non-Member) people are in your party. We intend to use this information to guide us to label foods containing allergens you list. I would like to make an additional donation to PSJC to help cover the full cost of the event. 2. Choose to add the cost to your account, you must be logged in to your account and then choose the pay later via the drop down menu. If you choose the pay later you must send in a check payable to Park Slope Jewish Center at 1320 8th Avenue, Brooklyn, NY 11215. Your reservation will not be confirmed until payment is received in the PSJC office. If you have any questions regarding creating your PSJC account please email Elana Ayalon, Director of Administration at office@psjc.org.